The stock market made its way into mainstream news in 2018 when it hit record highs and then subsequently tumbled 19% in a matter of weeks. Market volatility is unsettling to investors. But just who makes up the investor class? 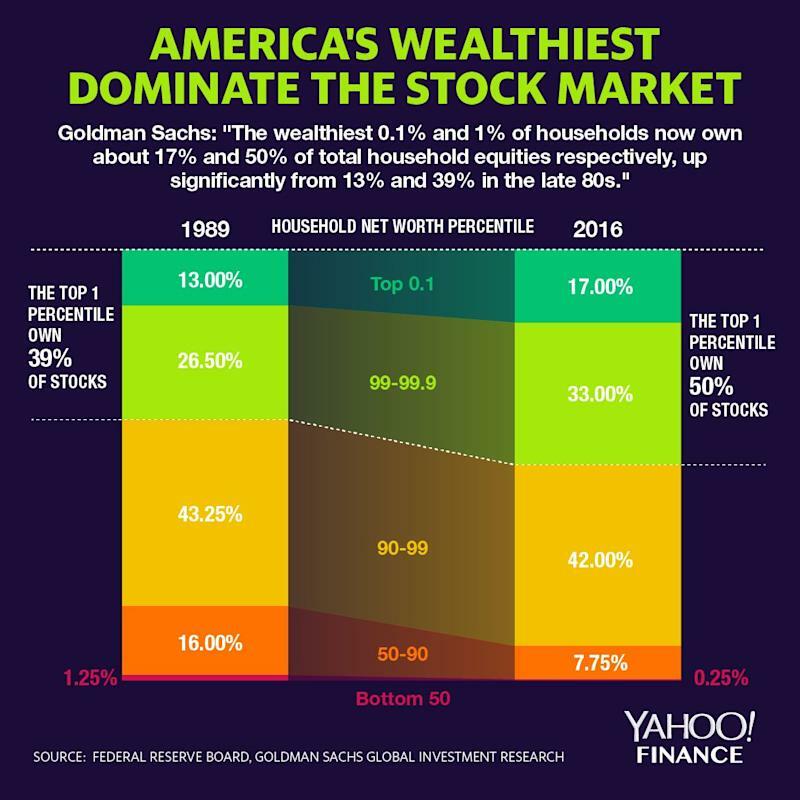 According to Goldman Sachs, stock ownership is extremely concentrated because of the growing wealth gap in the U.S., and thus the market’s performance affects households making up the wealthiest 1% of Americans much more significantly than the other 99%. “The wealthiest 0.1% and 1% of households now own about 17% and 50% of total household equities respectively, up significantly from 13% and 39% in the late 80s,” Daan Struyven, Goldman Sachs’s chief economist said in a note earlier this week. A toxic combination of slow wage growth and skyrocketing rents has put housing out of reach for a greater number of people. The United States achieves a mediocre score and ranks 23rd in the world and last among G7 countries. The United States ranks at the top for public spending on health care as a proportion of total government spending, but millions of people lack health insurance and experience poor health outcomes. Spending on education is also relatively high, but unevenly distributed. Spending on social protection is low relative to other rich countries. The US labor rights score is very inadequate for a rich country, with a minimum wage below what is needed to keep working families above the poverty line and unchanged since 2009. The United States is one of only five countries in the world lacking mandatory paid parental leave. We expect the US score to fall in next year’s index as a result of the tax reform that came into force this year.